Both Snag-It and Hypersnap are ovekill for getting fast screenshots for a blog post. My search led me to two light-weight screen caputure tools. 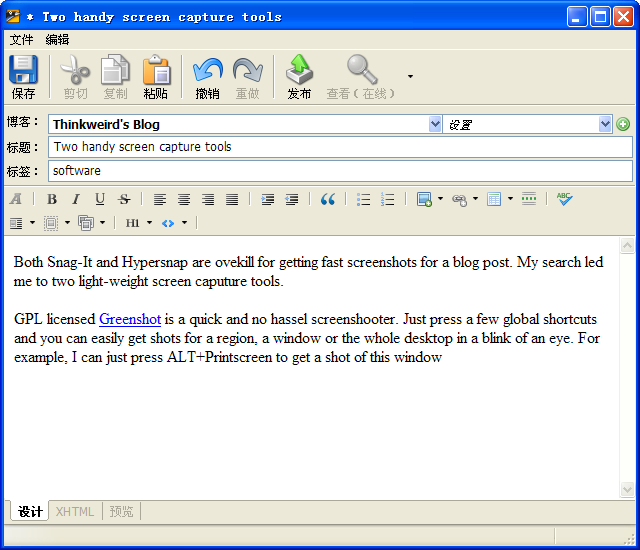 GPL licensed Greenshot is a quick and no hassel screenshooter. Just press a few global shortcuts and you can easily get shots for a region, a window or the whole desktop in a blink of an eye. For example, I can just press ALT+Printscreen to get a shot of this window and automatically save it to a folder for later use. If you want more advanced features like adding a watermark or resizing an image in a row after you capture a screen, WinSnap is the tool to use. Unfornately it is not free and it covers your screenshots with its logo if you use the unregistered version — rending the so-called trial time totally useless. Still, It is sweet to witness its power to process a caputured file based on the “effects” you designated and make it immediately available for use. The following screenshot has a water mark and is resized from the original one. Next PostNext What the perfect MS Windows is like?